Now hop on to the other Designers. You are in for a treat on this birthday hop! Like all 3 cards but the second green one is my absolute favorite here! You have used such cool colours to make this trio of cards. Love the sentiments. Great work!!! Love the colours and layouts you have used. Thanks for the hop. This is simply fab Vicki... it's great to join you for this special occasion! OOHH- that Happy set is a definite new favorite of mine- love when the fonts and sizes are mixed! Great job on your cards! What a fun looking set, Vicki. The recipient will love them! All very effective cards, I can't choose a favourite. Three spectacular cards! Love the big-sized sentiments! Three great cards! How can I chose a favorite. I'm glad you shared all three! Vicki your cards look awesome to say the least! Great stamp set, I've been to the store and I like their stamps. Would love to win and try them out! Incredible cards. great inspiration- different stamps and colours. Like the look of those ribbon stamps that you put to such good use in your amazing cards! 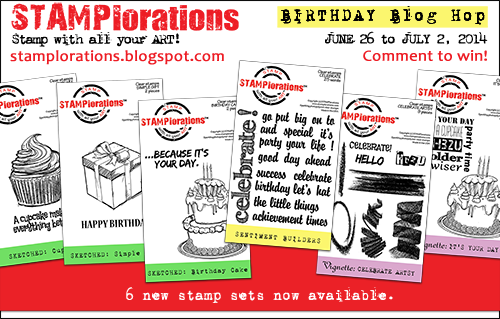 You and STAMPlorations stamps are a perfect match, and this set is simply more evidence! Love them all to bits and pieces! Also, a mega THANK YOU for selecting my type-writer card as a STS Runner-Up! Made my day...my week...my month!! Three great ideas for the same stamp. Great job. Love the way you have used the sentiment as a focal point and created different backgrounds - fab cards! Wow those backgrounds are awesome! Great cards, but the second one is my favorite - love the cut out happy and that the colors match the background! Great job Vicki! You make crafting look like the easiest thing on earth! Love the grungy-style! All three beautiful cards, allthough I think the first is my favorite! Great set of cards, would make wonderful card set to give someone. I love how you cut out the main sentements to make it look like they were die cut. Brilliant. I am loving this fun set. All great looking cards but my favourite has to be the first one. Great card...I mean, cardS! =) Love the colors! Fabulous set of cards, Vicki!! I love the artsy stamp set a lot and you have used it so lovely!! Love the bright colours you have used on these cards. Very, very beautiful!! Your inspiration is just non-stop!! GREAT set of cards, Vicki! I love the colors you used on the first one! 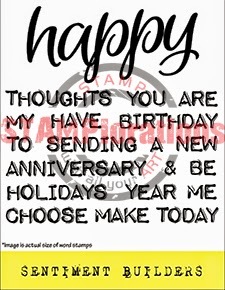 I like all three cards, and this stamp set...... It's so adaptable and so much can be done with it. Your cards are so eye-catching, Vicky! Love the designs and great bright colors!! Gorgeous cards - all of them. You seem to have a real flair for color and design!!! All three cards are fabulous. Great colors and CAS design. love them all.. great show of versatility of the stamps! All your cards are wonderful. I like them all!!! Three beauties here!! I love this stamp set - so many possibilities with it. Thanks for the inspiration. 3 wonderful cards! I especially love the background in the 3rd card! Beautiful cards Vicki. Love all the colors and layouts. I love that Happy stamp also! Fun cards! Love that 'celebrate' stamp! You're right the Happy is very Happy. I like all these but the turqoise one most of all. Amazing how much detail can be found in a CAS design - beautifully done! Happy Birthday STAMPlorations!